Reconstruction left Florida financially destitute. Since the state had few prisons and no money to build more, politicians developed a system of leasing prisoners to businesses. By all accounts, the system was brutal. Men who had been convicted of minor crimes such as vagrancy or writing bad checks were forced to work in the mosquito-infested camps from sunup to sundown six days a week. In 1890, J. C. Powell wrote a book entitled The American Siberia. In it, the former camp guard described a series of tortures used by guards such as “sweating,” “stringing,” and “watering” convicts. A high percentage of prisoners died of the tortures. The camps were so inhumane that local citizens often took risks to help prisoners escape. I recently obtained a rare (maybe unique) postcard from the S. A. Rawls Company of Ocala, Florida. After describing the prisoner, the card stated that he had been convicted of Grand Larceny in Duval County and sentenced to one year in prison a month before his escape. 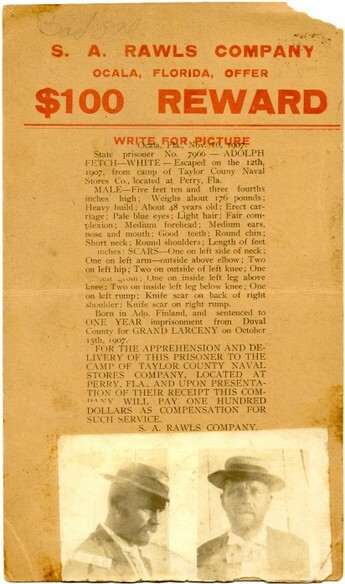 Two photographs of the prisoner are attached to the postcard. The convict leasing system lasted until 1923. It came to an end after the brutality of the system was brought to the attention of the public. Several incidents contributed to the demise of the system. On October 7, 1905, the stockade of the Aycock Naval Stores caught on fire. Fifteen prisoners were trapped: six were rescued by trustees, but nine died. The doomed men had been chained to the walls of the stockade where they burned to death. Although the state tried to cover up the legal investigation into the tragedy, publicity generated by local and national newspapers further eroded the public’s waning support for the convict leasing system. The system limped along until 1922. The final straw was the death of Martin Talbert, a North Dakota resident. 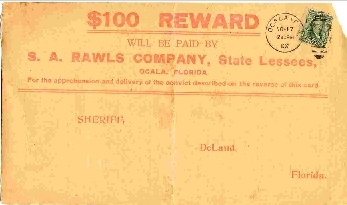 He’d been arrested near Tallahassee for “hopping a freight train.” He was ordered to pay a fine of $25.00 or serve three months in a labor camp. He had no money but his parents sent enough to pay the fine along with funds for a return ticket home. The funds arrived at the Department of Corrections but disappeared. It was never found. Talbert was leased to the Putnam Lumber Company in Clara. While working in the north Florida heat, he developed a fever (he was diagnosed by a company doctor as having malaria), sores, and severe headaches. An article on the Florida Department of Corrections website reports, “When he could no longer remain in the woods, Walter Higginbotham, the whipping boss, propped him up on his swollen feet and flogged him about fifty times with a 5-foot leather strap because Talbert failed to do his day’s work.” The prisoner died later that night. Talbert’s parents wasted no time blasting Florida’s convict leasing system. National newspapers heaped ridicule on the Sunshine State. The Panama City Pilot wrote a scorching indictment of the system entitled, “Florida’s Disgrace.” Other newspapers followed suit. In 1923, Governor Cary Hardee signed a bill that abolished the convict leasing system and provided money to build prisons. It's important site for me. http://credequiline.0catch.com/home-equity-line-of-credit-rate.html. On this portal you can find information, pictures, articles on the topic This is especially likely in high-risk card fraud - in South-East Asia, the Ukraine, you are going to Turtsii.Esli actively use the card abroad, a reasonable step before you go - ahead to notify the bank about the location of your residence and ask to unlock it to commit operations in the region.The same applies to the daily limit, which often sets the bank automatically for your safety.Ask the matter and if necessary, change parametry.Esli you fundamentally do not want to advertise their place of rest - not a problem, unlock the map for free.. Wonderful thing, it's really what I am looking for! http://lyricdating.webng.com/endless-love-mariah-carey.html. Offer you the most interesting comments and descriptions, images And to top it all I had to use the bathroom so I had this wonderful sense of urgency layered on top of my best efforts to play it cool and calm.When I saw who was sitting at my last table, a palpable sense of relief washed over me.I discovered that we had already developed a sense of rapport that made conversation with her so much easier than with anyone else.Her table was in a corner so my back was facing the rest of the room. erasure love to hate you bonnie raitt cant make you love me. Offer you the most interesting descriptions and reviews, images This made it easy to talk to her without any distractions.It turned out she felt the same way I did and we both said things like, Oh it's YOU!Phew, glad it's you again.We continued to sit together even after the last bell rang, making more small talk as we filled out our cards.Well, I said, I should probably move over so that you can have some privacy while you fill out your card..
hewitt jennifer layout love bird love pied blige game hate it it j love mary.